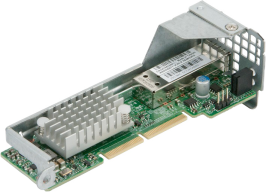 The Supermicro AOC-C25G-m1S, based on Mellanox® ConnectX-4 Lx EN controller, is the most advanced and compact 25GbE solution for our high density MicroCloud and Twin series servers. With MicroLP form factor and lower power consumption, it can fit in compact space-efficient server areas yet still provide the highest networking bandwidth for data centers. It is backward compatible with 10GbE networks and represents the most cost effective upgrade from 10GbE to 25GbE. The AOC-C25G-m1S, designed to provide the best performance and optimized Cloud efficiency, is an excellent choice for customers who need to expand their networks with the highest bandwidth connectivity.